“Uatzi” comes from the Purepécha indigenous language and means “children”. A few years ago, little Raziel with just 5 years of age along with his mother Azminda and aunt Fatima began organizing a group of folkloric dance. Their first presentation was in May 2015. They never imagined to be so successful. Currently, the group is composed of 4 members: Raziel (9 years), Raphael (9 years), Abigail (8 years) and the small Yaretzi (5 years). Without neglecting their studies, they have put aside their Legos and dolls to rehearse. 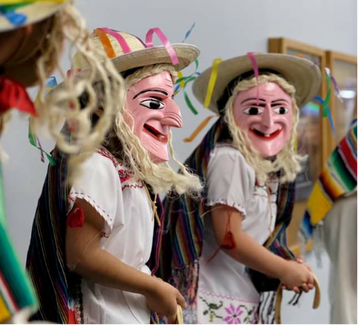 They dedicate their time to continue learning about traditional dances by watching videos of the “Carnival of the Virgin of the Wonders”. Born in Anchorage of parents from Michoacán, they have only been to Mexico once. Despite this, and thanks to the love his parents have instilled for Mexico and its roots, they love dancing and folklore. Inspired by the love that his maternal grandfather had for this type of dance, Raziel and his group will continue to perform and give their best. Raziel says that his soul beams with pride when he hears the applause of the people, and that in the future he hopes to dance even more. Behind the masks of the ”old men” there is a great innocent smile full of dreams and illusions. 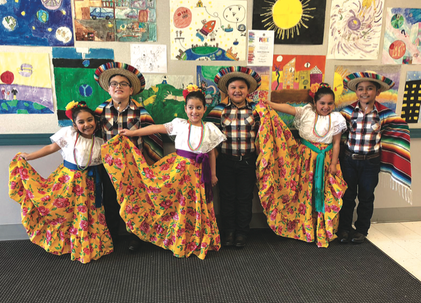 They seek to promote Mexico’s culture in other children of the same age and hope to continue having more presentations in their community.